A novel approach to achieving high areal capacitance and rate capability is demonstrated, whereby an active material is loaded onto a high surface area, filled Ni foam current collector. 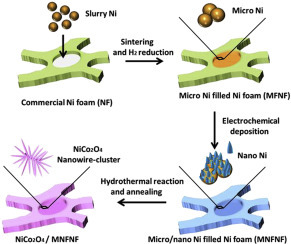 Micro/nano Ni-filled Ni foam (MNFNF) current collector was fabricated by initially filling commercial Ni foam with Ni slurry and sintering to yield micro Ni-filled Ni foam, followed by electrochemical deposition of nano Ni. This current collector has a greatly enhanced surface area compared to Ni foam, allowing for high mass loading of active material and thereby high areal capacitance and rate capability. Using NiCo2O4 prepared via hydrothermal reaction followed by annealing as the active material, an outstanding areal capacitance of 29.4 F cm-2 at 5 mA cm−2 discharge was achieved, while a high 80% of this capacitance (i.e. 23.5 F cm−2) was retained at 50 mA cm−2 discharge, ascribed to the high surface area and high conductivity of the MNFNF current collector. Regarding stability, only a 2% decrease in areal capacitance after 1000 charge/discharge cycles was observed. The approach employed here might be used to enhance the performance of other active materials besides NiCo2O4.